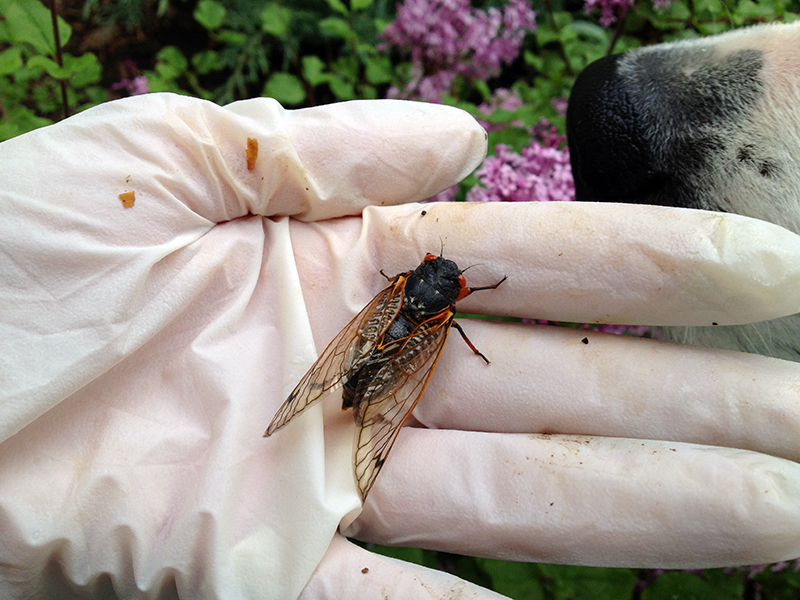 Brood II of the 17-year perennial cicadas has arrived! Last night I found this big guy in the woods sitting on a clump of irises and daffodils. I didn’t think the soil temp is up to 64 degrees at 8″ yet. I suspect some cicadas might have been driven out of the ground by the several inches of rain that’s fallen in the last few days. Still no deafening trill outside—that’s yet to come. Please excuse the creepy latex glove. I don’t normally walk around sheathed in plastic, it’s just that I sliced my finger open Sunday night and wanted to keep dirt—and cicada legs—out of the wound. You are currently browsing entries tagged with Brood Two at Bonafide Farm.